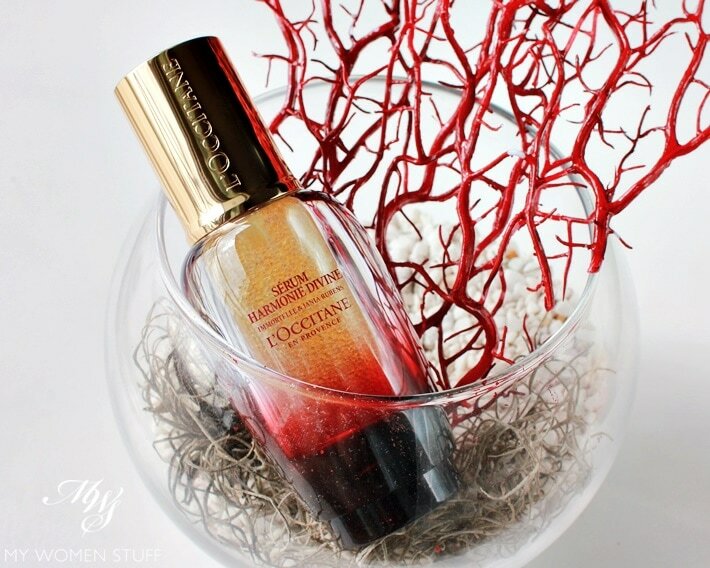 L’Occitane Harmonie Divine marries the iconic immortelle flower used in L’Occitane skincare products, and the Jania Rubens Algae, from the sea. This, I was told, is the first time that L’Occitane is using an ingredient from the sea in their skincare. For the Harmonie Divine range, L’Occitane uses the Immortelle Millesimee flowers, which are limited in quantity. These flowers produce an essential oil that is known for its anti-inflammatory and healing properties, as well as stimulating the growth of new skin tissue. To this, is added the Jania Rubens algae, a seaweed that continually regenerates itself. From this therefore, you can tell that the L’Occitane Harmonie Divine range is targeted at skin regeneration i.e. anti-aging. 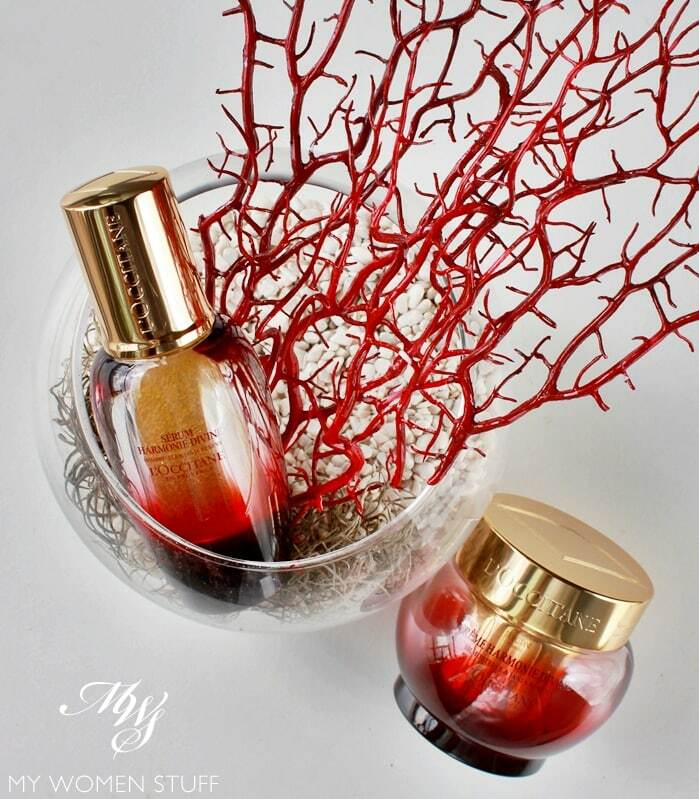 It is supposed to boost skin firmness and radiance, improve skin texture and facial contours. The key product in the range (as in most skincare ranges) is the serum. The Harmonie Divine Serum contains over 5000 micr0-drops of Immotelle Millesimee pearls blended with myrtle, camelina, evening primrose and borage oils, suspended in a water-gel enriched with Jania Rubens algae. Pump it out onto the palm of your hand, and apply it to your skin. 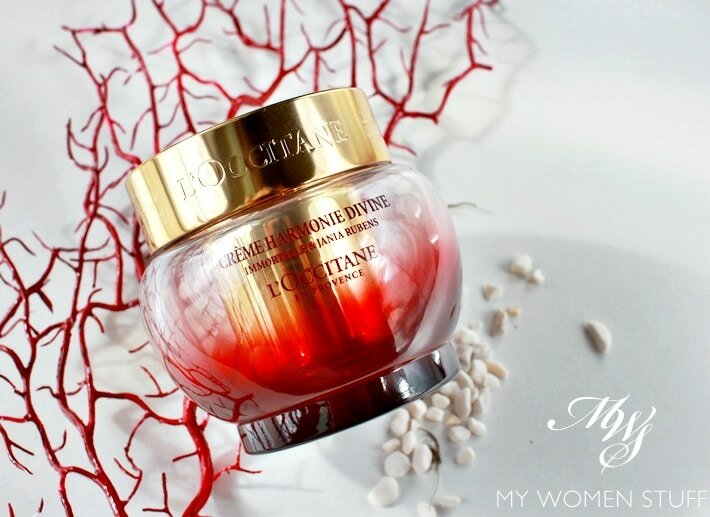 The texture feels incredibly light, and it sinks right into the skin without too much effort. It does not feel oily at all, and while I hate to say this, you notice an almost immediate smoothening of the skin on the back of your hand. It’s crazy! 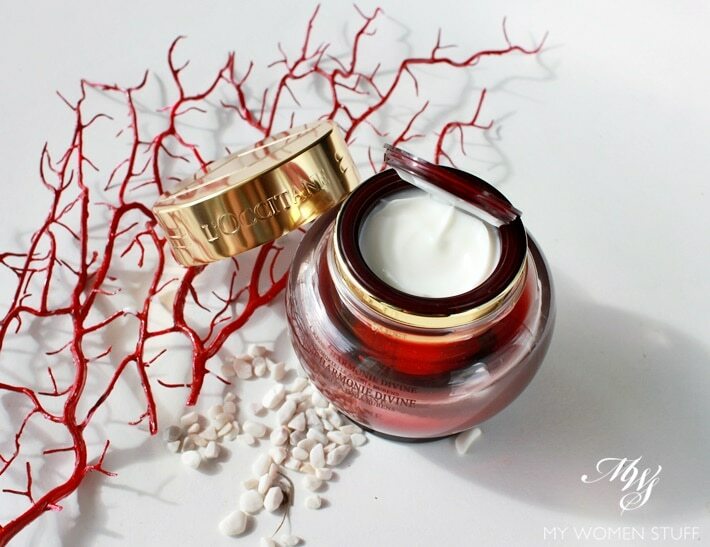 Follow up then with the Harmonie Divine cream, a slightly heavy textured moisturiser with a cream-to-oil texture. When applied on skin, the warmth of the skin causes the cream to melt a little, and it absorbs quickly into skin. It feels comfortable, and is supposed to boost skin radiance and suppleness. I wanted to show you the inside of the jar of cream, because I love the clever design, that comes with a hinged cover. A spatula is included for make it easy to pick up product, and both the cream and the serum actually come in a refillable packaging. Refills are sold separately, although I don’t think they are here in Malaysia. Remember I said this isn’t for everyone? It isn’t. The price tag alone, is prohibitive for many, who may not be so keen to spend that much money on a tube of serum or tub of cream. This then, is really targeted at the person who isn’t afraid of indulging in skincare, and who already uses L’Occitane’s Divine range. This one is the step up from that range. This is also really targeted at someone who needs a lift to their skin, whether in terms of radiance or facial contours. This isn’t for the 20-something, who is still chockfull of springy collagen. The texture of the cream is a little heavy, and really better suits someone in their late 30’s and upwards. Does this super luxury range of skincare intrigue you? VERY curious. The good thing about L’Occitane is how generous they are with samples. I might mosey in and see if they’d share one with me. Let me know if you try it! It’s their super swanky range!